Madurai, the city of Nectar is located in the south of Tamil Nadu. It is the second largest city in the state of Tamil Nadu. 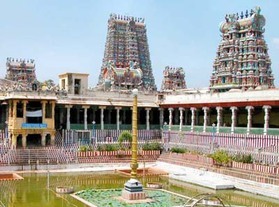 It is also considered as an important cultural and commercial centre of Tamil Nadu. Madurai is located on the banks of the river Vaigai. Madurai is bounded on the north by the district of Dindigul, on the east by Sivagangai, on the west by Theni and south by Virudhunagar. Madurai is situated at an altitute of 100.58 meters above the sea level and covers an area of 3741.73 square km. Madurai city has 3 hills as its city boundary mainly, Yanaimalai, Nagamalai, Pasumalai named after Elephant, Snake and Cow respectively. The city has been called the "Athens of the East" because of its great architecture and meticulous planning, comparable to that of the Greek capital. It was a fall from eternal glory to deep abyss for Madurai when the Tamil Kingdoms disintegrated, and its wealth was plundered by the ravaging armies of Delhi's Muslim rulers. In 1311, it was raided by Malik Kafur, the general of Alauddin Khilji of Delhi. In 1371, the Muslim rule of Madurai was put to an end by the Vijayanagar rulers who annexed the city to their Kingdom. . The Governors appointed to rule Madurai were called Nayaks or Naiks, and it was during their rule that the city regained some of its past glory. When the Vijayanagar empire collapsed in 1565, the Nayaks proclaimed themselves rulers of the territories they governed. According to a different theory, the name Madurai is actually a transformation of the Tamil word "Marudhai", which means a fertile agricultural land with alluvial soil. Many natives continue to refer to the city as Marudhai. According to some legends, Madurai is the actual site where the wedding between Shiva and Meenakshi took place. Some of the festivals which are celebrated in Madurai are the Teppam Festival, Meenakshi Kalyanam Festival. Teppam Festival is the most famous annual Float festival which is celebrated at Madurai. In this festival the images of Meenakshi and Lord Sundareswara are mounted on floats, and taken to Mariamman Teppakkulam Tank, where for several days they are pulled back and forth across the water in the middle of the tank, on an illuminated raft embellished with flowers, before being taken back to the main temple. Meenakshi Kalyanam Festival Meenakshi Kalyanam Festival is one of the most spectacular temple festival in Madurai. This festival is celebrated on account of the marriage of Meenakshi with Lord Sundareshwar (Shiva). The Chithirai festival is held annually on the full moon day of the Tamil month Chithirai (Apr. / May.) and commemorates the holy matrimony of Goddess Meenakshi and Lord Sundareswara. According to mythological legends, Lord Vishnu as Azhagar came to Madurai on a golden horse to attend the celestial wedding of Goddess Meenakshi and Lord Sundareswara (Lord Siva). The idols of the celestial couple are seated in a beautifully decorated chariot and taken around the town in the form of a procession. A large number of devotees assemble for the Meenakshi Kalyanam (weddings) celebrations and thousands of marriages are solemnized in and around Meenakshi temple on this extremely auspicious occasion. Avanimoolam Festival is held in the month of Aug. – Sep. and marks the coronations of Lord Sundareswara (Lord Siva). A play is enacted during this time. The temple priest recites the legends of Lord Siva in his 64 miracles, which saved Madurai from adversity. On the ninth day Lord Sundareswara is dressed like a worker and taken to the banks of river Vaigai. Madurai is well connected by air to Chennai, Mumbai, Bangalore, Tiruchirapalli and Calicut. Madurai is also well connected by rail to all the major towns in South India. Madurai has direct rail connections to Bangalore, Coimbatore, Kollam, Chennai, Rameshwaram, Thanjavur, Tiruchirappalli, Tirunelveli, Tirupathi and Tuticorin. There are excellent roads which connect Madurai to all parts of South India. To know the distances from Madurai click here.